Goal of the GT50 Open, that will debut worldwide at the 2019 Maiami Yavht Show, is to embrace the sea with simplicity and ensure owners more enjoyment. Najiba means noble and this name seems to be the best to describe the 58-metre Feedship super-yacht. Distinguished and elegant, it blends sleek and minimalist exterior lines with a detailed, high-end interior. Α period of great excitement and activity has officially begun for the Benetti shipyard that can be definitely called “Giga Season” since over the next few months 3 giga Yachts, each one over 100 meters in length, will be launched in Livorno. The eyes of the yachting world will focus on the Baltic Yachts after the launch of this cruising yacht. 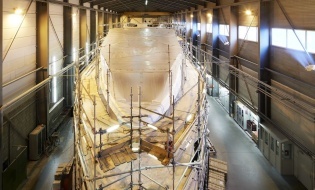 The 43 meter 142 Canova is getting prepared to hit the water next spring. ELALADREA+ is the new full-custom superyacht features modern exterior designed by Horacio Bozzo and luxurious and elegant interiors by Benetti Style Department.